Death to the Horde! Death to the Horde! Anyone who has read my posts here probably remembers my epic PvP Nightmare post. Well, I had another dynamic encounter with the Horde, this time in Westfall. Here’s how it all went down. I was in the Burning Steppes, leveling my two-handed axe and two-handed mace skills, both of which were very low (sub-50 per). I was attacking numerous foes and just letting Gav swing away until I died. I got them both up to around 200 when a whisper came from a guildie, asking me to run them through Deadmines. I agreed, being the nice guildmate that I am, and boarded the nearest gryphon to Westfall. I got there to find out that I was leading a level 20 Night Elf hunter (the one who originally messaged me) and a level 8 NE priest. A level 8 priest!! No level 8 should be running Deadmines! However, when I got there, there were more pressing matters at hand. A level 70 undead rogue was attempting to raid Sentinel Hill, so I killed him, netting me the Know Thy Enemy achievement. I killed him about three times, protecting my guildmates, when reinforcements arrived. However, they were for him, not me. A level 64 Blood Elf mage rode in, and her and the undead rogue tag teamed to bring me down. Once rezzed, a level 80 Night Elf Death Knight and I teamed up and killed them. Word came down that a Tauren druid was incoming, but he was only around level 60 and therefore was an easy kill. 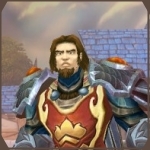 Lastly, a BE paladin, level 80, rode in and got in a staring contest with me, but they never flagged for PvP and left. Funny, if I were them I’d have tried my luck on a foe six levels below me, but they – even with their ally’s help – wanted no part of me. Funny. During this, the two guildies I was to run through Deadmines died time and again, so I told the hunter to run for the Deadmines while I protected the priest – who had to wait two minutes to rez after dying so often – and brought him over. After finally getting them into the Deadmines (the priest died about four more times, forcing us to wait constantly), the hunter and I opted to head in by ourselves. It proved to be a wise decision, because the priest went AFK instead of rezzing. We – or rather, I - mowed through the many miners, mages and such, and I bumped off the bosses, no problem. The hunter snatched up the goodies and loot, since I had no use for them. We cleared the dungeon, no problem. Quick note: I just looked up the rogue on the Armory, and he’s another noted PKer with 23k PvP kills and is nearly fully equipped with epics, including two Merciless Gladiator’s Pummelers. Compare my sword, a Forge Cobalt Claymore, and there’s no contest. More comparisons include him having 11% better crit chance, 60 more points in hit rating, and him having almost as much HP as me. The fact that he performed so poorly against me and my mostly green quest gear – I killed him 4 or 5 times, dying once, and that was only when ganged up on – may have played a part in the lvl. 80 BE paladin backing down. I’m baffled as to how I beat him around like I did… in theory, he should have pounded me. I’m more proud now then I was before. lol Go Gav! I guess what I was being told during while that undead rogue was slaughtering me back in Darkshore was right; paladins are a good match for taking on rogues.